As an icon, they are orange. But, in reality, carrots actually come in lots of colors. And sometimes they grow around each like intertwined limbs. When this happens, the kids call them kissing carrots. They think every wedding couple should be presented with a pair. I love that. And although the carrot roots are not my favorite, it turns out the green spray I used to toss in the trash, are filled with flavor. Random fact: When I was a kid, my hair was bright red. I was a carrot top. This, as my kids like to point out is ridiculous. 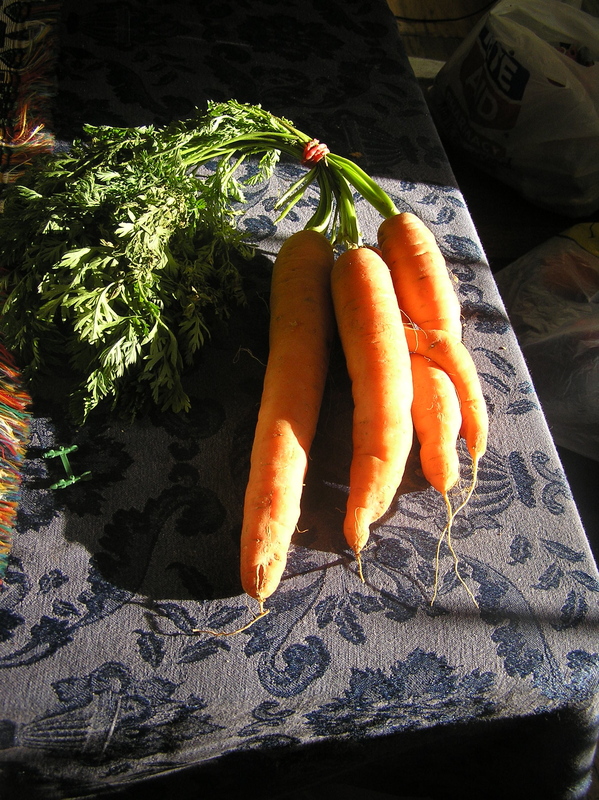 Carrot tops are green, and as I recently found out, super nutritious and versatile. I can’t believe that for years, I threw them out. 1) They’re packed with potassium. This, apparently, can make them bitter. So far, I have not had that problem. 4) They are versatile. You can use their leaves anyplace you might use parsley. But the carrot top has a much earthier taste. More like a mushroom than a green herb. They make a great addition to a salad. 5) Are great in soup stock. Carrots stay fresher without their tops. What I’ve been doing is snapping off the greens and storing them in a cup of water – the way you might with any other herb. Everyone loved when I used my kissing carrots and their tops to make this Whole Carrot Salad. Ok, everyone but the kids. But that’s for another post . . . .
Chop the carrot roots (with their peel on if they are organic) in the food processor (pulse) until they have a couscous texture. Put aside in a bowl. Chop finely the carrot leaves with a knife, like you would do with parsley. Remove the hard stems if there are any. Add to bowl with the carrot “couscous”, raisins and chopped mint leaves. Season to taste with lemon juice, olive oil and salt. Take a handful of carrot leaves, tear them up and put them in a tea-pot. Pour over boiling water and leave to steep until the tea is cold. Strain to remove the leaves. Place the tea in the fridge to chill. It will last well for about 3 days. “Our standards do not require outdoor access in poultry and in chickens that are raised for “broilers”, or “roasters” or “meat chickens” I’d like to explain how they get fresh air and sunshine. Unlike laying hens, these chickens have a very short life span. The majority of chickens raised for meat live approximately 6 weeks from birth through slaughter. Ours live a little longer, (up to 7 weeks) because we require a dark (sleep) period to slow their growth down, which prevents some leg abnormalities because of too rapid growth. The chicks need heat at first, most would not, even with “outdoor access” be out on pasture until 5 weeks at the earliest and only in warm climates. Farm to table in 7 weeks? Ok, that’s fresh, but it also seems a bit gruesome. It was a bit unnerving that the chickens we eat only live for 6-7 weeks. That seems like a blink. It’s less time than the kids get for summer vacation. But, then I remembered Charlotte’s Web, in a farm, many animals, unless they have a loquacious spider friend, may not live a long life. The Certified Humane Raised and Handled certification is not the only certification out there. And in fact, the Humane Farm Animal Care has comparison charts to compare key welfare standards of the current animal welfare certification programs developed since the Certified Humane® program was created. For info on programs other than chicken visit their site. But I’ve linked the broiler/chicken comparisons here. In my quick overview, the USDA/Organic overview was the least comprehensive. Several key items were listed as “Not addressed” including Dark/Rest period and Space when birds are housed. The Dark/Rest Period issue is important because when the lights are constantly on the birds eat continuously and they grow too fast for their skeletal structure. Apparently, this is the major cause of leg deformities and pain. According to the Humane Farm Animal Fact sheet, making dark period mandatory is the one of the most important issue for the welfare of these chickens. My once again speedy answer via email replied: they have windows in the barn that give them access to sun and fresh air. Technically, the Murray’s website did not lie. But their words did imply some sort of pastoral happy place that included out-of-doors. I read the pastoral inspired language and believed pastured. 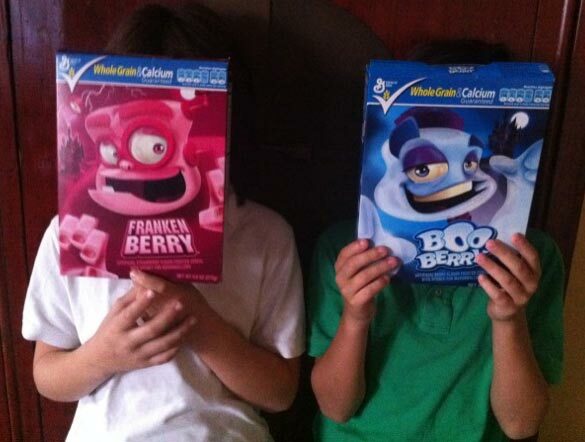 Which some would call good marketing and some might think is a bit of green washing. “Regarding our website , I have changed the wording on our web page to: Our birds have access to roam freely in their barns combined with an all-natural, all-vegetable diet with plenty of exercise. Wow! I was very impressed by their commitment to providing consumers with accurate information. For more complete info you can check out their Humane Farm Animal Care Standards February 2009: Chicken that I downloaded here. Which brings me to the next question. Who or what exactly is Humane Farm Animal Care? Humane Farm Animal Care is a national non-profit 501(c)3 organization which was “created to improve the lives of farm animals by setting rigorous standards, conducting annual inspections, and certifying their humane treatment.” They claim that the Certified Humane® Program is helping improve the lives of millions of farm animals. It all sounded great. But why wasn’t the freedom to go outside part of their criteria for the humane treatment of chickens? I called Humane Farm Animal Care and asked. The woman who answered the phone was very friendly and informative. She was also a mom, and she related to the difficulty of finding the right balance between ethical, humane, and environmentally sound choices and trying to stay within some budget. And she agreed that pasturing chickens ideal, but it’s hard to take a big industry and get movement – you have to start somewhere. She said that some of their farmers hold their farms to standards that are higher – their chickens may be free roaming or pastured. And that since they started the organization, they have seen that more and more producers moving toward better, more humane practices, and even more affordable products. So it’s working. But it’s still a work in progress. I can certainly respect that. So will I buy Murray’s chickens? Yes. They are still a more humane option compared to the huge industrial farm brands. But do they fit my new eating values 100 %? No. But at least now that I know what I’m getting with Murray’s chickens, I can make an educated choice. Murray’s to the rescue? Well, maybe. 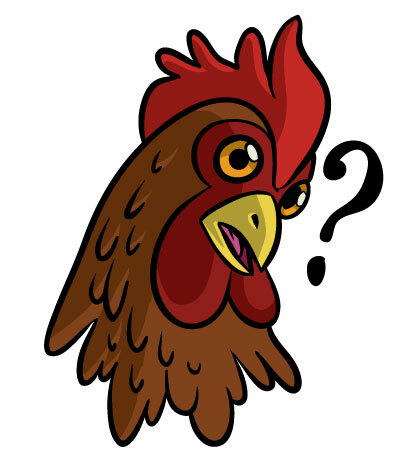 The other day, feeling a bit like Dorothy from The Wizard of Oz, I realized that the answer to my no-Styrofoam chicken dilemma was actually a lot simpler than I originally thought. In fact, the solution was right here in my own backyard. Ok it was a few blocks away. Our own “fancy” grocery store, Frank’s Market, sells Murray’s Chickens. And at $2.99 /lb for a whole chicken, it’s just may be a sustainable bargain. But is Murray’s chicken’s industrial chicken in disguise? So far, it seems to check out. According to the website, the chickens are locally raised — that means in Lancaster, Pennsylvania. Their homes meet and exceed the guidelines as specified under the Certified Humane Raised and Handled label which means they have access to fresh air and sun and combine an all-natural, all-vegetable diet with plenty of exercise. Each chicken has farm verification number. I plugged my number into the farm verification box on their website and found my farm. Ok. It didn’t tell me much except that there is a farm that my chicken came from. 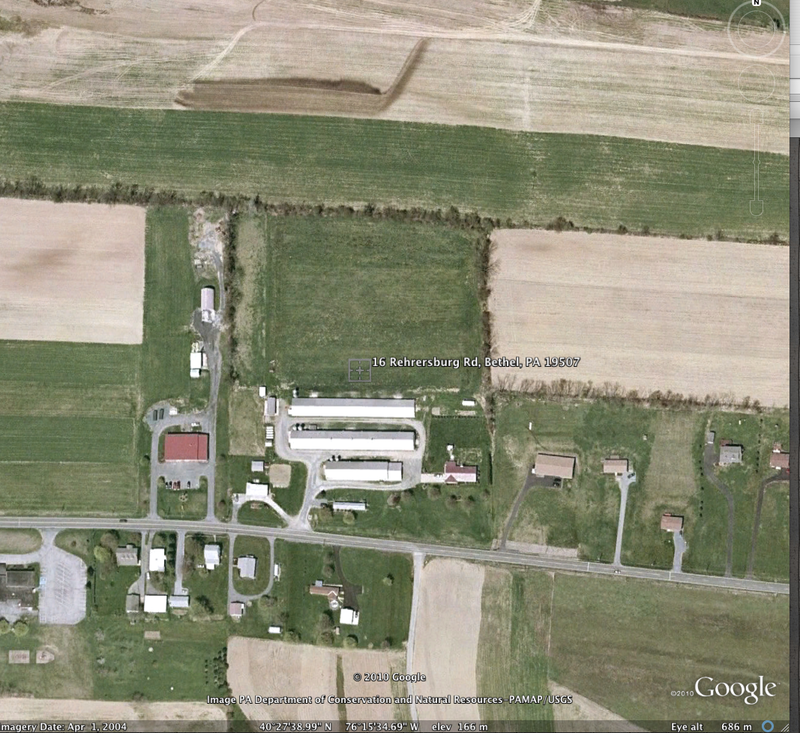 The website says I can see my farm in Google Earth. So I did that as well. All I could see was that the farm had plenty of green space. 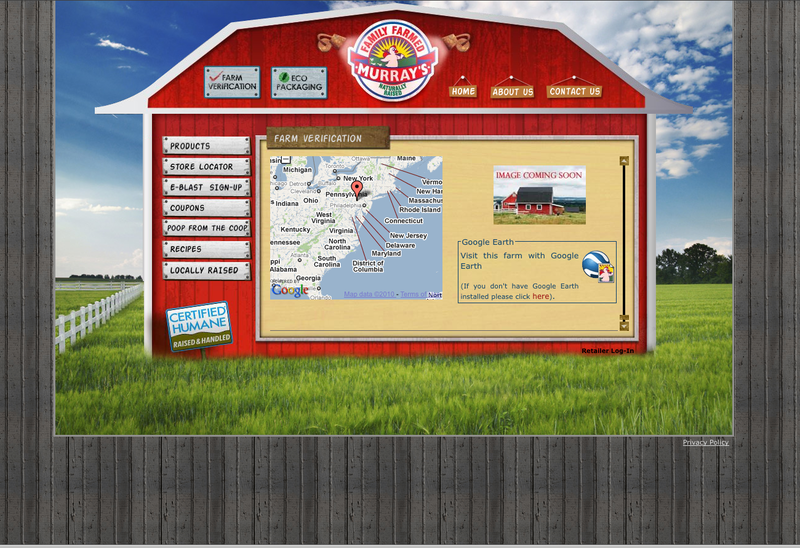 But it’s hard to tell, even from zooming in if the chickens are as free to roam as the marketing information promises. I did send off an email asking more specific questions, so I’ll post the info when I hear back. They do have “Eco packaging.” According to the website, that just means it’s made from one piece of plastic and doesn’t have a non-recyclable foam tray. Which, as anyone who’s been reading my me knows, is a big deal. My best option? If I had unlimited resources I think I would just buy the more expensive chicken from the farmer’s market. But don’t really know for sure if that is more sustainable or healthier. So for now, Murray’s Chicken is the most affordable (and convenient) choice for me. I may change my mind, as I learn more. This video is about the organic egg farming, but it is a really great visual way to understand what organic poultry farming really is and what it isn’t. Help the Cornucopia Institute fight big agribusiness from hijacking organic egg farmers. Support their Meeting October 25-28, 2010 in Madison, Wisconsin. If you can’t attend, you can download your Proxy Letter here.